I'm sure you get recommendations all the time for "must-see" TV, but this is different, you need to be watching Netflix and Charlie Brooker's Emmy-winning anthology sci-fi series Black Mirror. Created and written by Brooker, Black Mirror features stand-alone episodes that are sharp, suspenseful, satirical tales that explore techno-paranoia. Some could call Charlie Brooker's Black Mirror a contemporary reworking of Rod Serling's The Twilight Zone with stories that tap into the collective unease about the modern world. Tag to that, each episode (usually) sports a killer cast. 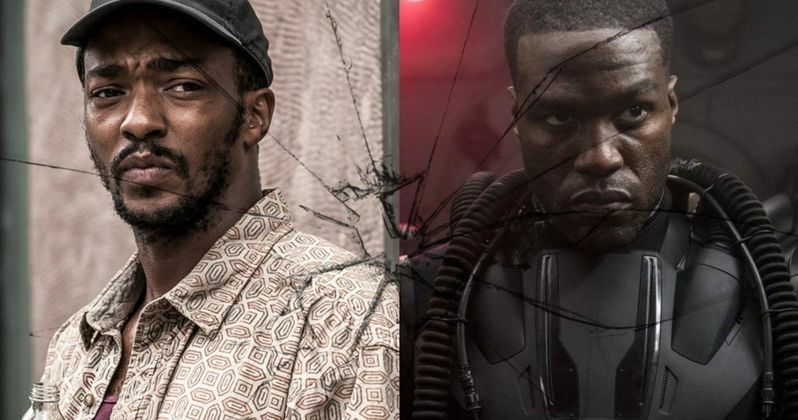 And speaking of which, Anthony Mackie (Captain America: The Winter Soldier) and Yahya Abdul-Mateen II (Aquaman) have been asked to join in on the upcoming fifth season. Netflix has been extremely quiet about the upcoming season and won't comment on the casting. But go figure, this is Black Mirror we're talking about here. Secrecy is the name of the game. No one even knew David Slade's interactive film Black Mirror: Bandersnatch starring Fionn Whitehead, Will Poulter, Asim Chaudhry, Craig Parkinson, and Alice Lowe was even a thing until about a week before it landed on Netflix back in December 2018. So again, secrecy is kind of a thing that goes hand-in-hand with these tales of techno-terror. Anthony Mackie started in Hollywood with roles such as Papa Doc in 8 Mile starring Eminem, and Killer 'Joker' in Hollywood Homicide starring Harrison Ford and Josh Harnett. He also had roles in The Manchurian Candidate, Spike Lee's She Hate Me, Clint Eastwood's Million Dollar Baby, and let's not forget his role as the ill-fated Tupac Shakur in Notorious. These roles were all before finally donning the metal wings for his breakout role of Sam Wilson / Falcon in The Russo Brothers' Captain America: The Winter Soldier a role he reprised in Avengers: Age of Ultron, Ant-Man, Captain America: Civil War, and Avengers: Infinity War. And (possibly) Avengers: Endgame. Most recently, Mackie played Takeshi Kovacs in Netflix's Altered Carbon. Meanwhile, Abdul-Mateen II is best known for his role as the evil Manta in James Wan's Aquaman opposite Jason Momoa. But the actor is also known for his roles such as Cadillac in Netflix's The Get Down, The Handmaid's Tale TV Series, The Greatest Showman, and Baywatch. Abdul-Mateen II can be seen in a theater near you this weekend in Jordan Peele's new nightmare Us and can be seen next in Peele's reboot/sequel to Clive Barker's Candyman and Damon Lindelof's Watchmen series over on HBO. Going back to Black Mirror again, season three might be the best yet in my humble opinion. After all, it features killer episodes such as James Watkins' "Shut Up and Dance," Owen Harris' "San Junipero" starring Gugu Mbatha-Raw and Mackenzie Davis, Dan Trachtenberg's "Playtest" starring Wyatt Russell, and Joe Wright's "Nosedive" starring Bryce Dallas Howard and Alice Eve. But that said, the most recently released fourth season is a close second in the running for the best one yet. Episodes featured include Jodie Foster's "Arkangel" starring Rosemarie DeWitt, John Hillcoat's "Crocodile" with Andrea Riseborough, Tim Van Patten's "Hang the DJ" starring Georgina Campbell and Joe Cole, David Slade's "Metalhead," and Colm McCarthy's "Black Museum" starring Letitia Wright. And let's not forget Toby Haynes' "USS Callister" starring Jesse Plemons and Jimmi Simpson. This super-sized episode is the new flagship entry in the series in my eyes. If you watch one episode of Black Mirror make it "USS Callister." You won't be disappointed. This casting update comes to us via Deadline.